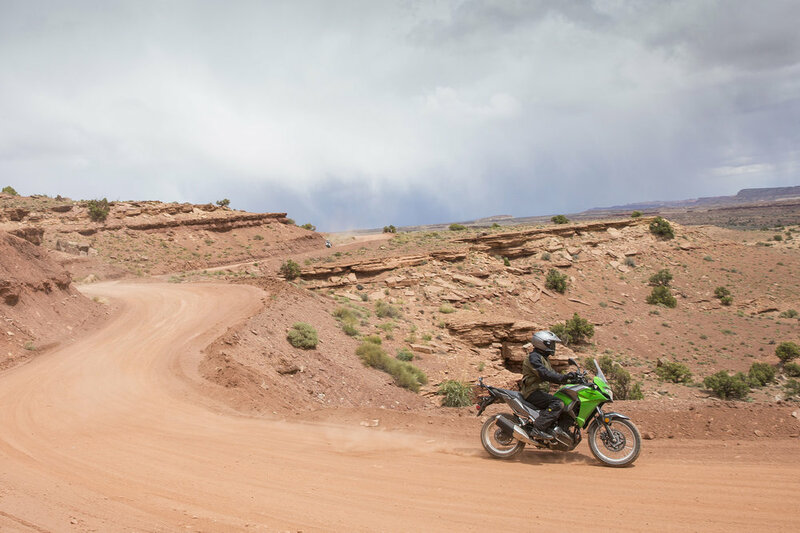 Southern Utah is an adventure rider’s dream. Around every turn are wide, untamed vistas, ample off road opportunities, twisting mountain roads and awe-inspiring landscape. It’s also where Kawasaki decided to showcase its latest entry-level machine, the Versys-X 300. This is a new model for the green brand, aimed at new or less experienced riders. And it comes with a lot of features that make it particularly amenable to this segment. First is the liquid-cooled, 296cc Parallel Twin engine. A compliant mill that’s also found in Kawasaki’s Ninja 300, this engine handles freeway speeds and slow-speed maneuvers with skill, it’s just never in a rush. Just after leaving our start point in Green River we proceeded along Interstate 70 at a clip just above 80 mph (the posted speed limit by the way) and the powerplant worked like a charm. True, it was in top gear a few thousand rpms from its 13,000 redline, but it didn’t struggle and transmitted negligible amounts of vibration. A positive mark for riders looking to log long miles at high speeds. The tall, non-adjustable windscreen proved its worth at this early stage too, deflecting wind off all but the top of my helmet. I’m six-foot tall so this machine will offer suitable wind protection for a broad range of riders. We then turned down Highway 24 on our way to Goblin Valley State Park, an odd but completely captivating area where sandstone rock has eroded in such a way as to create an otherworldly scene. This is also where we found ourselves handling some of the first tight turns of the test and the Versys-X 300 proved to be quite light on its feet. Weighing in at a slight 385.9 pounds, the machine tips into corners effortlessly. 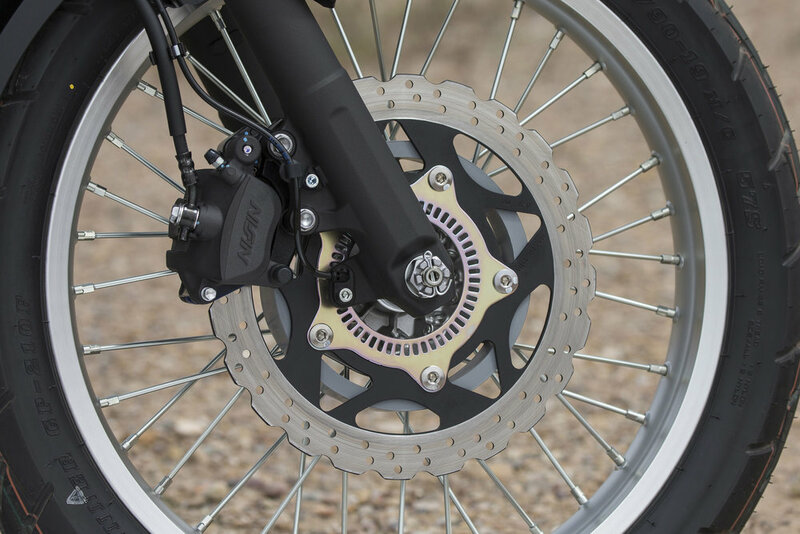 The Showa fork and preload adjsutable KYB Uni-Trak, bottom link rear shock are a well-balanced duo too, particularly for an entry-level bike, keeping the Versys-X stable and predictable through the corners. We then got to tax the suspension a bit more during a ride up a gravel road just outside the park. The set-up performed commendably against the loose debris, potholes and hidden rock edges we encountered on our way up to the photo stop. Kawasaki reinforced some of the structural elements of the suspension, like the lower fork tube and rear shock mounts to improve the rigidity of the package. The frame is a steel tube design without a separate subframe, and the engine is a stressed member of the design. It is a stable platform and provided good feedback from the terrain underneath the IRC Trail Winner GP-210F tires, whether it was dirt or asphalt. It is slim at the tank and comes with standard passenger grab rails out back, along with a lash-down platform on the tail section. All in all a more-than-suitable chassis package for a bike priced at $5699 (with Bosch 10M ABS, non-ABS prices at $5399). Riding briefly off-road also allowed me to sample the comfort of the bike while standing on the pegs. The indentations on the sides of the 4.5-gallon tank were positioned well, allowing me to squeeze the tank with my knees. If anything, a taller set of handlebars would be a positive upgrade if you plan to do much standing on the bike. But as is the Versys-X 300 works well for a rider my size. Hearing the rocks kick up against the underside of the machine made me all too aware of how exposed the new, twisting header pipes are. Kawasaki designed them to help improve low- and mid-range performance, along with an updated airbox. However, a protective cover would be high on my list of modifications if I were to own a Versys-X. After the off-road fun we got back on Highway 24 to reach our night’s destination in Torrey. I appreciated the precise fueling of the Versys-X during the ending stages of the ride on Day 1. That, along with the measured but responsive throttle and slip and assist clutch, made moving through the powerband easy and comfortable. Power and pull are tame but consistent through the rev range and make it simple to rack-up the miles, even after a long day in the saddle. The seat is an area that the Versys-X 300 falls well short of what I’d want on a touring bike though. It’s hard and uncomfortable, and the accessory ERGO-FIT seat, which adds an inch to the stock 32.1-inch height, is no better. For Day 2 we wound our way across Highway 12, getting a taste of some higher elevations and superb, sweeping mountain turns. Again, the Versys-X 300 is planted and stable in these circumstances, and a really fun bike to ride. Keep the revs high, since the engine is at its best above 8000rpm, and you can flick back and forth with ease. The 19-inch front and 17-inch rear wheel combination don’t bother the sprightly nature of the bike in the slightest. The instrument panel has all the standard information you’d need, with the addition of some touches like a gear position indicator and MPG estimations. I saw the bike getting between 40 and 50 mpg in most circumstances. After a quick lunch we proceeded down to Highway 14 to climb through the Dixie national Forest on our way to the end point in Cedar City. Climbing above 9000 feet in elevation didn’t harm the performance of the bike in the slightest and it was an ideal way to finish off an already incredible, beautiful ride. Optimum airbox shape and intake duct enhance engine performance. The airbox is also slim and compact which contributes to a slimmer overall chassis width allowing riders to touch their feet to the ground more easily. Light pistons help boost performance at all rpm. 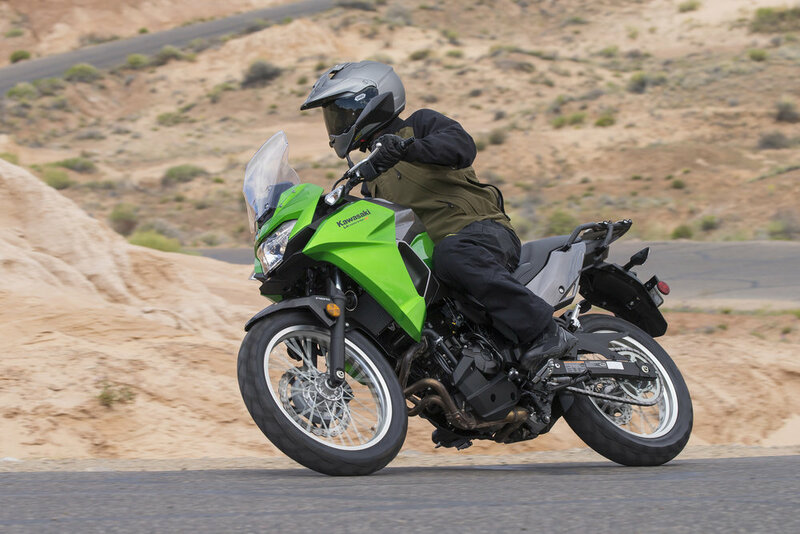 A lower compression ratio helps reduce piston temperatures so that the Versys-X 300 runs on regular gasoline. Oil jets spray the pistons, which have grooves to help direct the oil to the entire underside of each piston, to aid piston cooling. Short piston pins help reduce reciprocating mass to maintain high-revving engine character. Crankcase design features a large-volume, finned oil pan that increases cooling performance. Equipped with dual throttle valves(KP) for optimum performance and rideabilty. Sub-throttles, located before the main throttle valves in the throttle bore, are controlled by the ECU to precisely control airflow for natural, linear throttle response. Exhaust header tucks close to the engine and helps enhance low and mid-range power for adventure-style riding. Roller-type shift drum provides smooth actuation and great shift feel. Short final gearing enhances low- to mid-range power feel and response. An exclusive Kawasaki user-friendly feature. 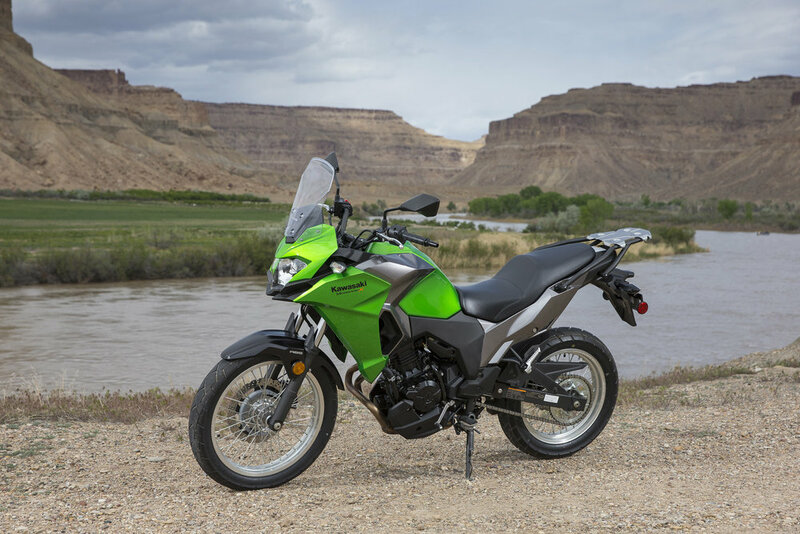 Specifically designed for the Versys-X 300, the new frame provides increased capability to handle rough paved roads. Simplified construction and strategically-placed thinner brackets and lightening holes contribute to a low overall weight. Designed to provide ample front-end feel for rider reassurance. Uses the rigidly-mounted engine as a stressed member for added stiffness and weight reduction. The frame was kept slim beneath the seat to help reduce the rider's reach to touch the ground. 41mm front fork is 4mm larger than that on the Ninja 300 and has 10mm more travel for increased capability on rough paved roads. Front fork conveys excellent feedback for a more reassuring ride. 17mm hollow front axle adds to front end rigidity and stability while reducing weight. 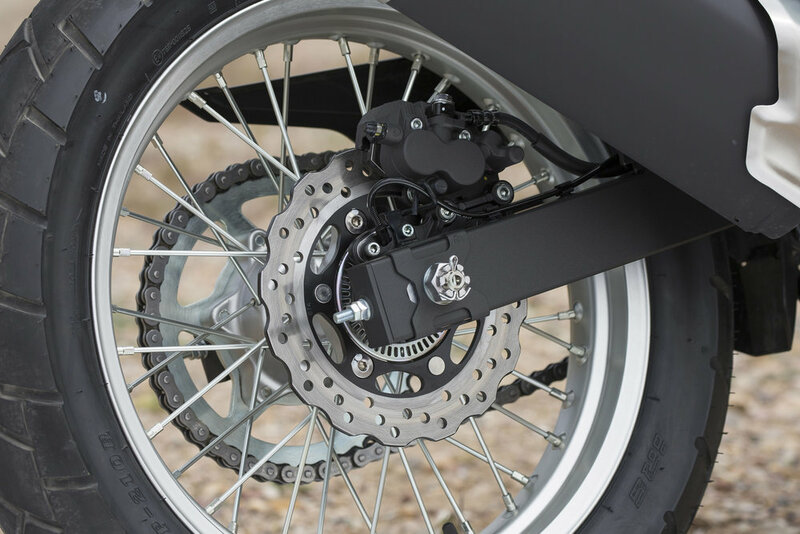 Bottom-link Uni-Trak® rear suspension is also tuned for rough paved roads and contributes to ride comfort. Long swingarm contributes to handling and riding stability. 19-inch front and 17-inch rear spoked wheels with lightweight aluminum rims. Multi-purpose tires add a strong adventure-style image. Rugged design features rally bike styling. Imposing styling also gives the impression of a bike with much larger engine. Upper cowl epitomizes aggressive Kawasaki style and is topped with a large windscreen to enhance riding comfort. Air ducts below the headlight helps reduce hot air build up inside the cowl in warm weather. Side cowl has large opening for efficient heat dissipation from radiator. Lower engine guard style cowls appear to cradle the engine and add to the adventure look. Upright riding position provides a comfortable perch both in the city and on the open road. Wide handlebars and steering angle assist low-speed maneuvering. Large-size seat is slim between the thighs to make it easier for riders to reach the ground while the rear of the seat has ample width for passenger comfort. Large-diameter rear grab bar adds to passenger comfort. Flat rear carrier is level with the seat for excellent cargo-carrying performance. Rubber-cushioned footpegs reduce vibration for increased ride comfort. The cushions are removable for a more direct feel and increased boot traction. Modern instrument panel with analog tachometer, and multi-function display that includes digital speedometer, gear position indicator, fuel range, current and average fuel consumption, Economical Riding Indicator(KP) and coolant temperature.